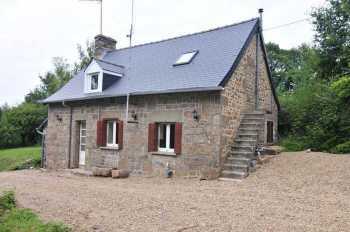 Properties for sale in Brittany, France - AHIB-SP-001105 Pretty 2 bedroom detached house with 2.5 acres and outbuildings in quiet rural hamlet. The property has been completely renovated since 2010 with a new roof, re-wiring, new kitchen and bathrooms, new windows, flooring and decoration. It stands in an elevated position with adjoining outbuilding and has plenty of bridleways nearby. Viewing is highly recommended. The nearest town of Louvigné-du-Desert with its shops, supermarkets and restaurants is about 5 minutes away. The property is about half an hour from the UNESCO heritage site Mont St Michel and 15km from Fougères. 'L'Ange Michel' leisure resort is 10 minutes away. The property is well served by airports at Rennes (45 miles) and Dinard (56 miles). There are regular ferry services from Saint-Malo (1 hour away). There is a TGV main rail line from Rennes too. The nearest beach is at Genêts (20km). The D-Day landing beaches and the Loire area are about 2 hours away. The main towns of Saint-Lô is 1 hour's drive and Nantes is just under 2 hours' drive. Open Plan Lounge/Dining Room/Kitchen 5.40 x 3.89m Partly glazed door and window to front elevation. 2 convector heaters. Granite fireplace with wood-burner. Laminate flooring. Cupboard housing electrics. Stairs to first floor. Kitchen Area 3.30 x 2.90m Window to front elevation. Laminate flooring. Ceramic sinks with mixer tap. Built-in dishwasher. Built-in fridge/freezer. Space for range style cooker with extractor over. Range of matching base and wall units including display unit. Worktops and tiled splash-backs. Study/Bedroom 3 2.93 x 2.42m Laminate flooring. Window to side elevation. Convector heater. Shower Room 3.41 x 2.01m Large shower. Heated towel rail. WC. Pedestal basin. Tiled floor. Space and plumbing for washing machine with worktop over. Wall units. Partly tiled walls. Extractor. Vent. Landing Wood flooring. Window to front elevation. En-Suite Bathroom 2.49 x 1.41m Tiled floor and partly tiled walls. Velux window to front elevation. Sloping ceiling. Heated towel rail. Pedestal basin. WC. En-Suite Bathroom Velux window to front elevation. Laminate flooring. Heated towel rail. Bath with mixer tap/shower fitment and tiled surround. WC. Inset spotlights. Gravel drive. Garden to front and rear. Outside lights. Outside tap. 2 Single Garages constructed of corrugated iron. Metal up and over doors. Attached to one is a corrugated iron, block and timber barn 8.43 x 4.98m. Attached stone shed. Attached to house Tool shed/Store. Mains water, telephone and electricity are connected. Drainage is to an all water septic tank installed in January 2018.